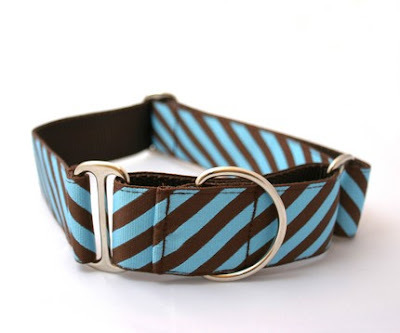 Our greyhound's collar and leash are going to match his daddy's guitar strap. How freaking adorable is that? All of you pet lovers out there must check out Kyra's shop. She has collars for dogs and cats of all breeds and sizes. And I can assure you that you will not find such stylish accessories at your local pet store. love it! when is your puppy coming home? i want to see pictures!! Oh it comes in a martingale collar...my dog has to have that. She's an escaper. And I end up chasing her down the street screaming "Why do you want to leave me????" I might need to buy this, for my cat. Does she sell guitar straps too? Tam, she doesn't sell guitar straps... but maybe she would be able to make a custom order? I don't know, it could be outside her realm of expertise, but it couldn't hurt to ask. We found Andrew's guitar strap at a craft show in Pittsburgh in November. It is made out of vintage fabric, which happens to be extremely similar to the collar I ordered. Woot. You should have woofed! Not meowed! The answer is VERY! Very cute! i'm probably going to end up getting two for carmelo just for being SO handsome. it's the "squirrels just wanna have fun" and the "wonderdots" for him. he also has a collar of lil whales from http://www.souldier.us/, which could be the party responsible for andrew's guitar strap. aw! Your pup is going to be so handsome!